Have you ever asked yourself how much time your workers spend in the washroom? You are not the first. Research in the UK came to the conclusion that the total of the time spent in the bathroom per year is 41 hours. Trying to cut down on that time is not wise or humane and it will not be taken lightly by your employees. But, there are still ideas that you can use and help that time become useful and not wasted in terms of work. Even Steve Jobs recognised the potential that spending time in the washroom can have on employees. He made sure that the washrooms at Pixar are well designed but simple. Additionally, comfy and sweet-smelling bathrooms can improve employee satisfaction and this leads to better productivity. Therefore, these two reasons alone are enough for you to consider investing into a well-maintained, fresh, sanitised and well-equipped washroom. Don’t forget;we’re here to help with making this happen. As for design, perhaps your washroom does not have to go through a major makeover. Let’s dive in and take a look at the design details that can make all the difference. Photo Courtesy from: Link Here. You don’t want your employees bumping into each other because of the poor light in your bathroom. On the other hand, you do not want an overly bright washroom, as well. You need a perfect balance of accent, task, and decorative lights. This is essential for a nice washroom. 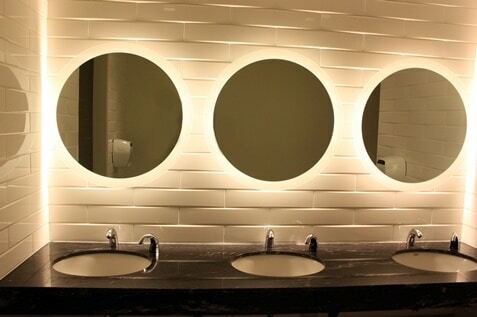 Task lights are needed for the washroom mirrors. Keep them on the sides and not above the mirror. Lights above the mirror put a strong spotlight on the forehead, making the face look more tired and it emphasises bags under eyes, even if they are not there. It is better to have several 45 to 75 watts bulbs around the washroom, than one strong central light. Use dimmers on your lights if it is too complicated to change it entirely. It goes without saying that your washroom needs to have proper and efficient ventilation. At times, that is simply not enough. Spray air fresheners – it usually sprays fragrance as needed, depending on the size of the washroom and the frequency of use. Fan air fresheners – these usually work continuously, so they spend more, but the odour control is more thorough and constant. Sanitizing units – these cut the odour and germ problem at its bud. Sanitising all critical spots around the washroom, sanitizers get rid of the germs before they become airborne and cause the odour issue. Freshzone ozonizer – generating ozone means killing off germs before they start causing troubles. Moreover, it prevents mould from forming which also makes washroom healthy and odour-free. Alsco odour control system can make all these sanitizers and fresheners available to you, easily. Your employees are very sensitive to the state of the washroom they need to use. Sleek, elegant, functional, and modern washroom equipment does wonders for the morale. Hand hygiene systems are important. Touchless systems for hand drying, toilet paper and soap dispensers mean a lot. Those perks, combined with discrete bins for feminine hygiene tell your employees that you care about their comfort and health. A survey conducted in Singapore showed that only 50% of people wash their hands after using the washroom. All of those people touch the doorknobs when entering or leaving the washroom. Therefore, you need to figure out the system that involves doors without knobs or even washrooms without doors. You can either use the heavy doors with push system that enables doors to be pushed by the entire body. Or you can have a stainless steel surface for pushing that is easily sanitised. Or, you can avoid the doors altogether, introducing the labyrinth system for the entrance. It is hard to completely relax if you cannot get enough privacy in your stall. It needs to be easily closed and locked. Also, it is really annoying if it is not obvious if the stalls are occupied or not. Make sure that there are clear signs for the stall availability. For example, if the key turns, it also changes the sign on the stall doors from green to red. Dirty and uncomfortable toilet seats are unacceptable in any circumstances. You can have great lighting, excellent design, perfect equipment, but all that is in vain if the toilets are unclean. You can ensure fresh and clean toilet seats by installing toilet seat sanitisers that kill 99.9% of known bacteria. Also, you need properly managed washrooms with regular cleaning and good maintenance. Jackets and bags easily get on your way when you are in the washroom. Therefore, you need to find the place for people to put away those things while they are using the toilet. This means you need different hooks, pegs, and shelves all over the place, including the inside of the stalls. If your workplace is baby-friendly, you need a good changing table for mothers and their babies, as well. You do not need a disco in your washroom, but some relaxing, ambient music is more than welcome. Pick the kind of music that is used in day and health spas, for example. You can use online radio stations that stream ambient music non-stop. Moreover, a slightly more turned up volume inside the stalls gives the users more of the much-needed privacy there. Do not underestimate the need of your employees for hot water. Every well-equipped washroom should include the access to hot water. There are some eco-friendly options to heat water nowadays, so make sure you are using those options. 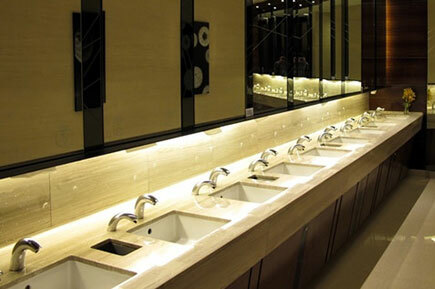 It is obvious that overall experience is important when it comes to the washroom in your workplace. A good designer will do a great job at organising an efficient and comfortable washroom. However, the maintenance is up to you. It can be a time-consuming task. However, if you contact Alsco representatives, they can take that load off your shoulders. Call Alsco at +65 6455 0150 today. You will be given a price that is perfectly tailored to your needs. 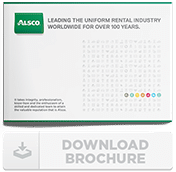 Alsco staff will come to your office, install and fill up all the necessary equipment.